My thanks to Cityluxe for loaning me the Kaweco Perkeo for review. Kaweco Perkeo is Kaweco’s foray into the world of entry level fountain pens. Previously the cheapest entry into fountain pens that Kaweco had to offer were the Kaweco Sport series. Those are a little niche to be an entry level pens, mainly because they are pocket pens. Fundamentally, that’s quite a departure from regular entry level pens. Now with the arrival of the Perkeo, Kaweco officially has a horse in the race. 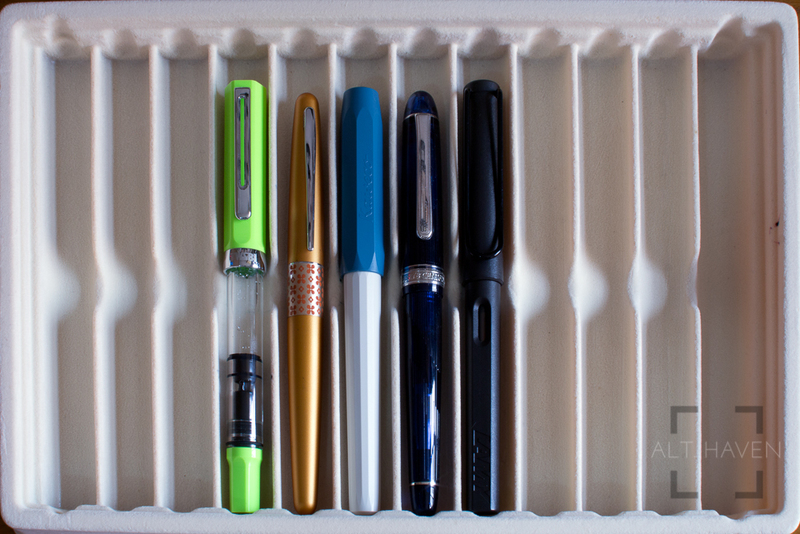 The Perkeo is basically standing up against the Pilot Kakuno, Lamy Safari and Pilot Metropolitan just to name a few well known entry level pens. 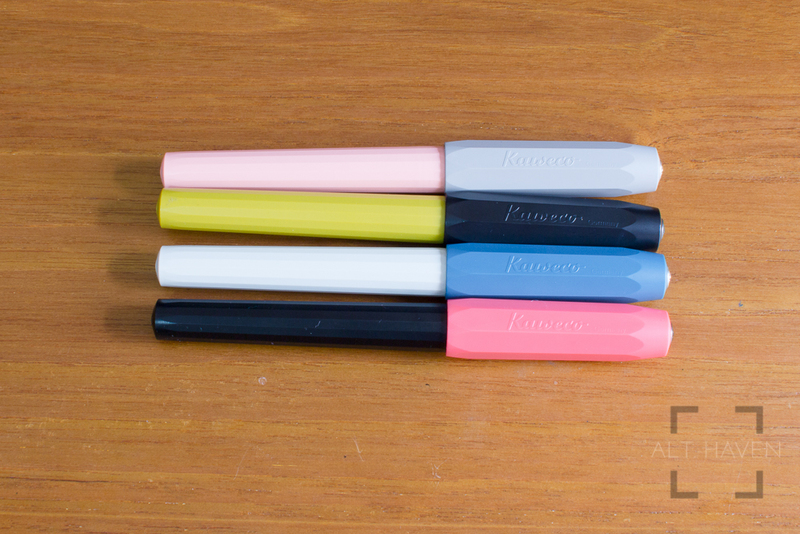 The Kaweco Perkeo comes in 4 different colours namely, Indian Summer (black with yellow), Bad Taste (pink with black), Old Chambray (blue with white) and finally Cotton Candy (grey with pink). The names that Kaweco have for the pens are fun and interesting. They have a nib choice of F and M only. The nibs are either the standard stainless steel ones or a black coated stainless steel nib depending on the colour of pen you buy. The Perkeo is a faceted pen. The cap resembles the Kaweo Sport’s with it’s iconic 8 sided shape which tapers to a flat top. On the top you can find the Kaweco logo embeded there. The cap comes off easily enough and closes with a satisfying click. The body is likewise faceted but significantly more than 8 sides. One thing to note, the Kaweco Perkeo doesn’t come with a clip so if you like clipping your pen to something you are out of luck, but I am not sure if the Kaweco Sport clips which are sold separate;y fit the Perkeo or not. The entire pen is made of ABS plastic which makes it light weight but durable. The cap can be posted if you desire but personally I prefer using it without posting. With the cap posted, the balance of the pen can be slightly back heavy. Otherwise, the balance of the pen is rather good. The grip section is moulded with a triangular grip. In terms of its need for your fingers to conform, it sits right between the gentle triangular grip of the Pilot Kakuno and the totally you must hold me this way of the Lamy Safari. Personally the triangular grip never works for me but I can easily hold the pen the way I am used to regardless of the grip. This is one part where your millage may vary. I’ll suggest dropping by a shop to try it out on your own to decide. The grip’s triangular-ness aside, it is long and wide enough to provide sufficient place for my fingers to rest on while I write. The Perkeo takes the standard international long and short converter and cartridges. I had no problem using it with my standard international Faber-Castell converter instead of the standard blue ink cartridge it comes with. This opens up a wider world of inks to the Perkeo. Although Kaweco do sell their own short international cartridges there are plenty of other brands that sell their inks in the same format. By buying a converter for the pen, you won’t be limited to only brands that sell inks in the cartridge form. As mentioned earlier, the Perkeo’s nibs comes in two sizes fine and medium. There is also the regular silver stainless steel ones as well as the plated black stainless steel ones. You will get the black plated ones comes with the pens with black in their body or accents. In general, I found the regular nibs write better than the plated ones. They write smoother and has a very very slight give when compared to the plated ones. These nibs are by no means soft so please don’t flex them. The plated nibs tend to feel stiffer. 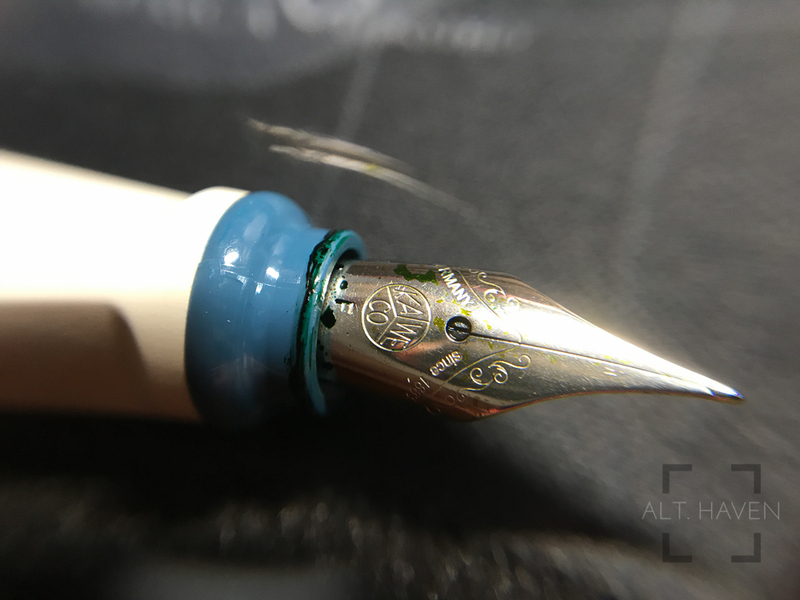 A nib being stiffer or softer isn’t a judgement on how they write. Depending on your use case, you might prefer a harder nib in some cases and a softer one in others. Strangely, the plated M and the regular F looks really similar in terms of line width so take care when choose the nib size. Overall, the Kaweco Perkeo is a decent entry level fountain pen. However it is standing up to some very compelling competition from Pilot Kakuno and Lamy Safari. 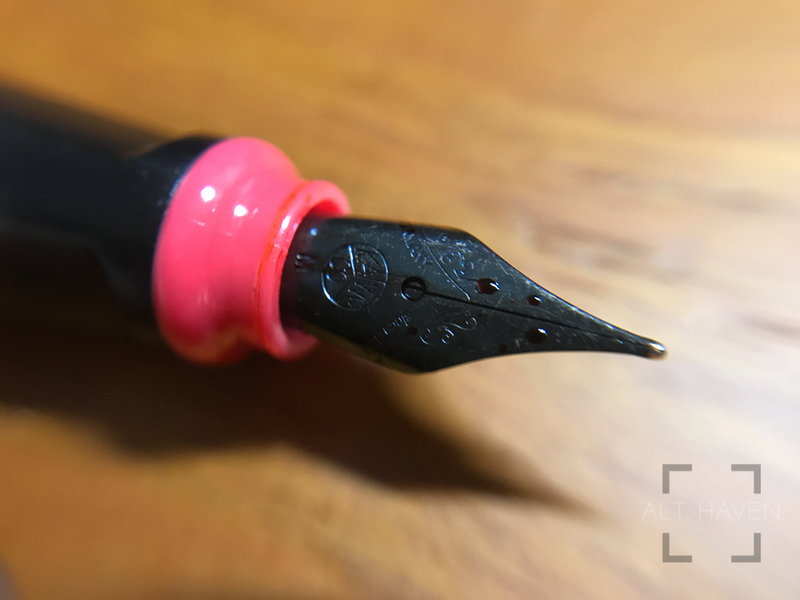 The Kakuno has the advantage of being cheaper and their nib widths run narrower. The Lamy Safari has a ton of colour choices and a full range of nib options. It practically boils down to aesthetics from the way I see it. If you enjoy the way the Kaweco Perkeo looks, it will give you a decent view into the world of fountain pens.